petition: Justice For Panda Regarding Animal Cruelty! Justice For Panda Regarding Animal Cruelty! Please see the below letter to local Judge & District Attorney regarding an 'Animal Cruelty' case & SIGN this petition to help make a greater impact. Kaplan needs to be held responsible for this horrific crime! 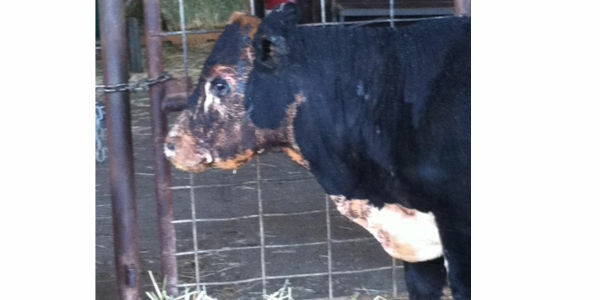 In November 2013, Garrett Kaplan allegedly broke into a high school's barn & set fire to a four-month-old FFA steer named Panda, who sustained severe burns over 50% of his body & nearly died. He was left with life-long scars, some of which even now are still healing, & one ear was burned off & the other was damaged. Police say DNA evidence linked Kaplan to the crime. On September 11th, 2014, you will be deciding the fate of an accused man named Garrett Kaplan. He has been in court a few times now regarding the felony Animal Cruelty case of Panda the steer. I have been in court EACH of those times, along with other supporters & some of my youth assts/Jr Vets closely following this case. My name is Genete M. Bowen...& I am a local resident, pet owner & animal lover, animal welfare advocate, Animal EMT/CMT, as well as the Founder of DogE911 'All Pet Emergency Training' & the Paws Division Director for International Firefighter Cancer Foundation. This case HAS bothered me since the beginning! I have helped in the process of making sure that Panda was moved to an animal sanctuary in northern CA, as well as monitoring his progress there. He is doing quite well, BUT that shouldn't mean that the crime against him should go unpunished! I feel 'all Animal Cruelty' should be punished to the full degree. Offenders need to know that the courts & law will not allow these autrocities to occur! There are more laws protecting a home than an animal. If you vandalize property it's a crime, but with animal abuse/cruelty most of the time the offender gets away with it. Sadly an animal & a sweater are considered the same...ones property! What is the difference here...one is a LIVING thing! Thanks to groups like NCOVAA (National Coalition On Violence Against Animals), ALDF (Animal Legal Defense Fund), & other national agencies working on animal laws...we are making progress. More courts/judges are handing out maximum sentences on Animal Cruelty. 'Animal Law' covers all statutory & case laws in which legal, social, or biological of non-human animals is a factor. This covers all companion animals, as well as wildlife, animals used in entertainment, & animals raised for food! More lawmakers/legislators are speaking out, as well as supporting & writing Animal Legislation. CA is one of the leading states & has prosecuted & given maximum sentencing to animal offenders/abusers. I work with many of these lawmakers at the CA State Capitol & am glad to see the changes continuing to expand! PLEASE do not allow Garrett Kaplan to get off on these horrendous charges of felony Animal Cruelty or plead down to a lesser charge or misdemeanor! Please keep CA moving forward on the path toward stricter Animal Laws! I WILL be at the next hearing, as will many other supporters & a couple of my Jr Vets...we HOPE to see that you take this case & 'all Animal Cruelty' as a serious matter! Please look over the letters & signatures you've been provided regarding punshing to the 'FULL extent of the law' of the accused, Garrett Kaplan. The 'Animal Cruelty' case of Panda the steer NEEDS to be taken seriously, that was why this petition was started. We have signatures from all over the world because those that abuse animals, we know will go on to do it again or even abuse humans! We hope this will help to make an even greater impact on your decision so that Kaplan is held responsible for this awful crime! 30 Animal Welfare Supporters came to the courtroom on Sept. 11th dressed in lime green to make a stand against Animal Cruelty! The Judge & DA have received many letters & the printed petition signatures thus far. Next step is a court appointed 'psychiatric evaluation' for Kaplan. The next hearing will be on October 2nd. Panda supporters WILL be there! We are trying to make sure this case, & ALL Animal Cruelty/Abuse cases are taken very seriously.